Last year my studio partner and I moved (me, for the fourth time!) 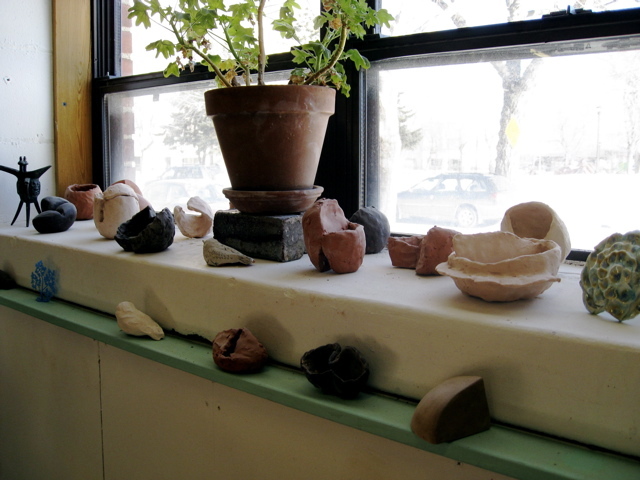 into a new space at the Northern Clay Center. The corner studio that we share is really one of the best, and I often must remind myself to be very very grateful for having such a wonderful place to do my work. Having windows that face both west and south mean not only great light and views to the happenings on the block, but added airy-ness too. But in the winter, the frigid air easily comes through the single paned windows, and the airy-ness of our rock-star-corner-suite is a little less than lovely. So this year, in an effort to save on heating costs, the staff of NCC has decided that they will put plastic over all of the windows in the studio. I know it is good to save energy where we can. And I am sure I will enjoy not having to wear a hat all the time. But couldn’t 3M have come up with a more aesthetically pleasing option? But really, the worst part about the plastic over the windows is that I have to decide if I want the windowsill to be completely empty, or if I want it to become a diorama of sorts. I really like being able to use all of the space in front of the window. It has been a perfect spot for my little maquettes and inspirations. But knowing that anything left on the sill will not be able to be moved or replaced until the weather warms makes it not quite so perfect anymore. The big blank white surface of the empty sill will certainly be a change. It will be interesting to see if having a clear view out my window impacts my work. This entry was posted on Friday, January 16th, 2009 at 1:39 pm	and is filed under Main. You can follow any responses to this entry through the RSS 2.0 feed. Both comments and pings are currently closed.